If you are looking to obstruct a view, block out your neighbors this is the shrub for you. 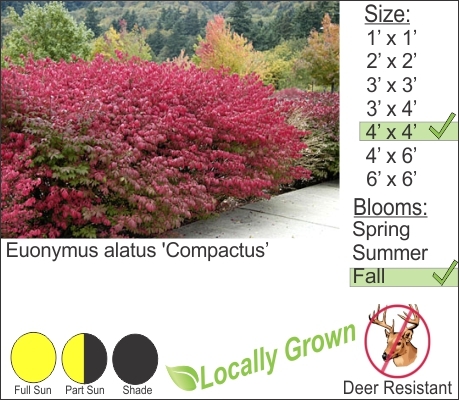 Burning Bush is a fast growing deer resistant shrub that has a dense branching habit. Hard to kill this shrub can grow to 8ft. if you allow it. You can also maintain this shrub to your desired height by trimming it annually. Make sure that you plant at least 4 ft. off of the driveway so the shrub does not crowd the area. Burning Bush has one of the most vibrant autumn color displays. When the early morning low angle sun hits the leaves in Autumn, Burning Bush holds true to it’s name and the shrub really does look like its on fire.